As Copenhagen's resident bicycle anthropologist for the past three years, I've seemed to have acquired the ability to spot subtle changes on the bicycle landscape. Some are easy to determine and even to explain, but this one is tricky. 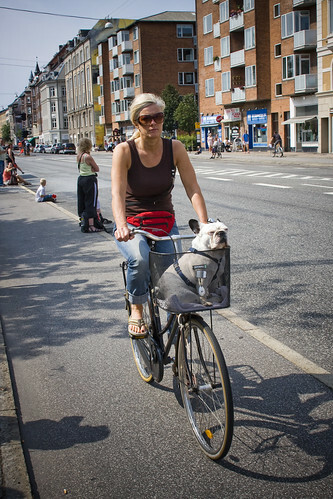 Copenhageners have transported pets by bicycles since the bicycle was invented. It's nothing new. 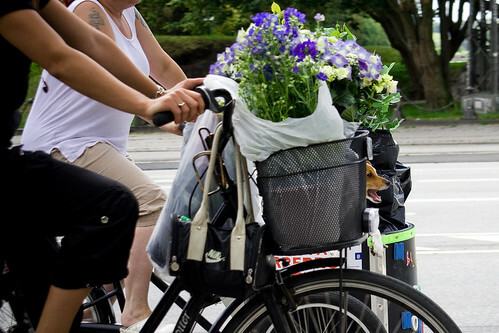 However this summer I seem to be seeing a lot more dogs on bicycles. I haven't been able to find any reference to an increase in sales of dogs and the Paris Hilton-inspired 'accessory dog' trend died off a year or so ago so I can't really explain it. Which doesn't make it any less aesthetic to look at. Here you can play Find the Dog. And here are a couple of shots from Amsterdam from our Amsterdam Cycle Chic set. No larger dogs, in cargo bikes? I remember Nihola has a special canine-targeted model called the Cigar Dog... You've only noticed people transporting relatively compact canines? Not much in the way of Labradors, German Shapherds (Alsatians), Pyrenean sheepdogs, St. Bernards or (last but certainly not least!) Great Danes? Seeing you're a cinematographer, I'm looking forward to the upcoming dogumentary. 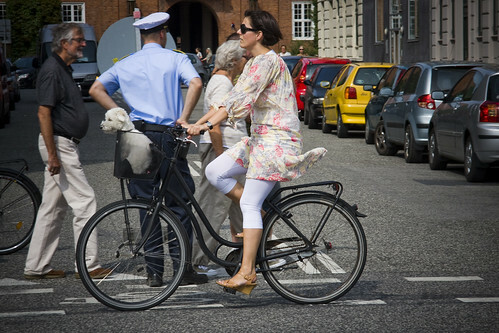 Possible tiitle: "Yappaliciousness, or a Dog's Life Cykel"? "Shapherds"? How did I miss that? Should be "shepherds", of course. herding shaps is an artform. *sigh*... My cats woke me up in the middle of the night: I remembered that shaggy creature as soon as I had posted. i have a basket just like the 2nd pic for my dog! she loves riding with me! It is all over the place. Everyone has dog's on their bikes. I even saw one wearing a helmet that matched it's owners- I couldn't focus the damn camera fast enough!